So, I ran the Gold Coast marathon last weekend. Or rather, I ran the first 21 or so kilometres, ran the next 10km feeling pretty awful and then ran/puked the next 10km. Suffice to say, that was not the race I had hoped for. So now I have to do another one ASAP to make up for it. Which counts as crazy idea number 1. Except that, obviously, I see nothing crazy about it at all. Crazy/sensible idea number 2 is to try and make every recipe from Rose Levy Beranbaum‘s book Rose’s Heavenly Cakes – yes, the book I bang on about basically every time I post here. I just love this book. 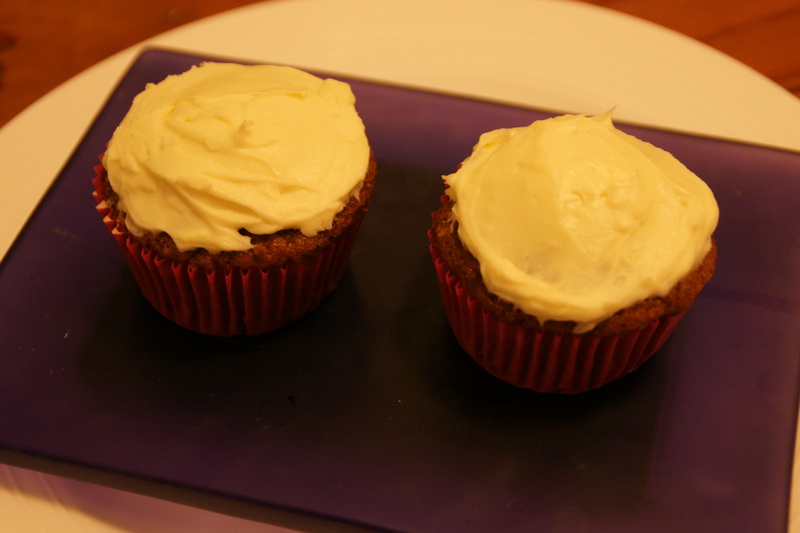 I made another recipe from it today – her carrot cake with white chocolate and cream cheese frosting. Only I made it as cupcakes for the husband to take to a relay. And yet again, Rose came up with the goods. 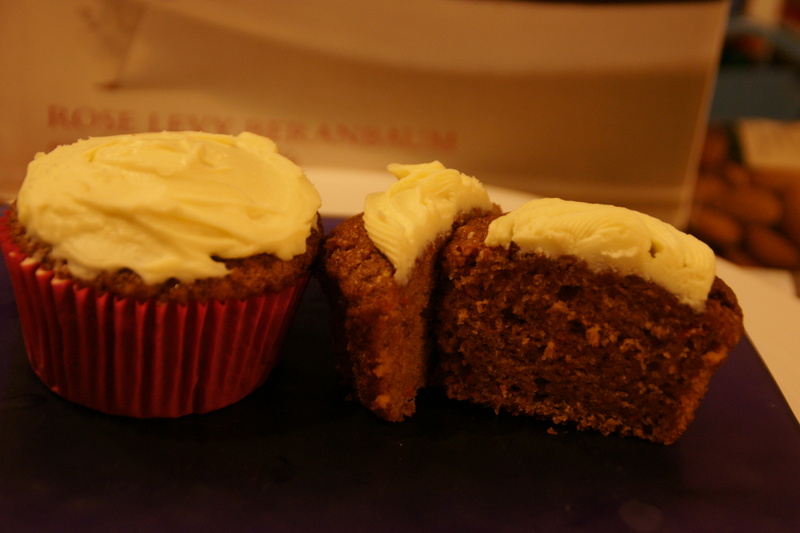 I tried a bit and it was delicious, even for someone who is not a huge fan of carrot cake. Here are some photos. I basically whacked the icing on as the husband was in a hurry to get to the race. Next time I make it (assuming I have time to make it through the whole book and come back to this one) I will take the lazy option and make it as one big cake. So, what do you reckon? Should I bake my way through Rose’s Heavenly Cakes? And will you help me eat them? I’m just worried about overloading my neighbours! There is only so much cake they can eat, I imagine. You must be itching to run by now! Amazing without running how much time I have ‘found’ for baking 🙂 Lots of new things being tried out, surprise find was that I quite like Spiced Pumpkin Cake, wouldn’t have ever though of doing one before. Should get go ahead to run (gently) on Weds, so pre-empted the appointment with a gentle 6k today (I am officially slow & unfit). What marathon are you thinking of? Any trail plans later in year – really must catch up with you somewhere (and maybe even get to sample a cake??). Woohoo for running! I was planning on doing the M7 marathon but I may readjust and aim for Sydney. And then Fitzroy Falls – will you do that? And may I please have your pumpkin cake recipe. I LOVE pumpkin cakes. I’m with you, a big fan of Rose’s Heavenly Cake book and a might challenge you have set yourself. I often find myself reading the book and having grand ideas.